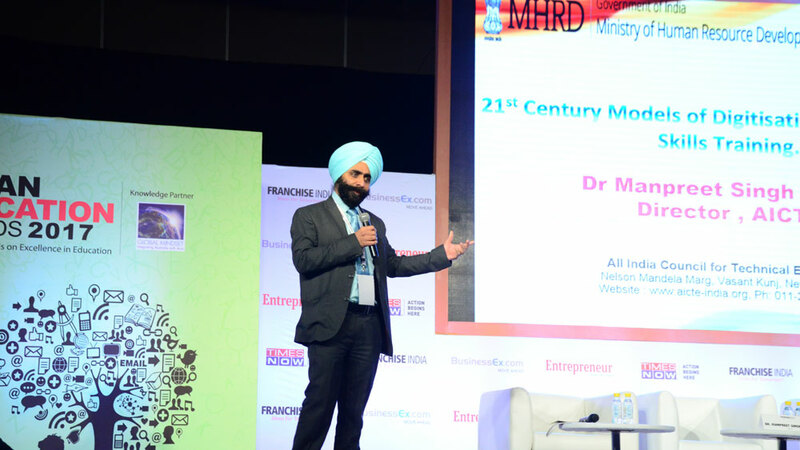 At Indian Education Congress 2017, we were addressed by one of the leading minds in the Education Industry, Dr. Manpreet Singh Manna, Director of AICTE, who spoke about the challenges faced when technology meets Skill Industry. It feels as if new and diverse technologies are continually arising and in some cases disappearing. In some parts of the world, new technology brings excitement and an easier way of life. In others, new technologies might leave out entire communities. Rural and suburban areas of developing countries which often have minimal infrastructure and resources often make up these excluded populations. The keynote session of India Education Congress 2017 was commenced by Dr. Manpreet Singh Manna, Director of AICTE, spoke about the information tools and how it helps to grasp, deliberate and distinguish the content. He further elaborated,” Communication between parents and their wards have seemed to diminish.” Thanks to the Communication Technology. It is the Communication technology that influences business and society by making the exchange of ideas and information more efficient. And when I am talking about Communication technologies, I clearly mean the Internet, multimedia, e-mail, telephone and other sound-based and video-based communication means, added Dr. Singh. We have to give it a thought, whether we were connected earlier or today in this era of Communication Technology. It is a rigid fact that what we could discover in the last 5 years, we never have thought of it in the last 100 years. It means we are moving with pace and time. But the question is, are we moving unidirectional or uniformly? -It is unfortunate that since the past 8 years, 68000 patents have been registered in India. Out of which 12000 are from Indians and the remaining from the MNC’s. -India is a skilled country with various innovations reaching out in every field. But going by the present scenario, Technology is given more importance than skills. -There is an ongoing debate in the country about the Employments of students where there is a dire want of education leaders and not teachers and mentors. They are in search of job creators rather than job seekers. The Director of AICTE gave us an insight about SWAYAM, which is the acronym for Study Webs of Active-Learning for Young Aspiring Minds. He further mentioned in his speech,“ This was the largest innovative move by India in 2017 and I feel myself proud that I feel privileged that I am the in charge for the ‘SWAYAM’ project, Government of India. According to the information available on the SWAYAM website, the courses hosted on SWAYAM will be in 4 quadrants video lecture, specially prepared reading material that can be downloaded/printed, self-assessment tests through tests and quizzes, and an online discussion forum for clearing the doubts. “It is the national platform where any student of UGC & AICTE can earn 20% credits to this SWAYAM quota”, said the Director of AICTE, in his concluding speech. Changing Dynamics of Real Estate Business..
Top 3 Trends in Primary Education..
Empowering Education with the Right Solutions..